Corresponding with guests, cleaning crews, owners, managers and everyone else is a daunting task. Until you start using Bookerville's Email Templates. 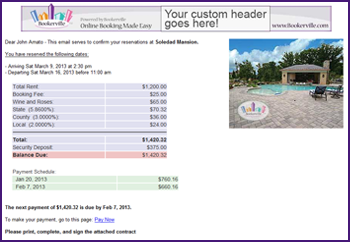 How many emails do you end up sending to various people for each booking? Responding to guest inquiries, sending quotes, confirmations, payment reminders, past dues notices, cleaning crew reminders, owner updates, key swap offices, security deposit refunds and thank you notes - it's a lot! Bookerville's Email Templates provide you with a set of convenient and typical emails that you can custom-tailor to fit your needs. Once these are set, sending accurate, professional emails is as easy as a click! Pre-Populated Information: Vast library of "tags" pre-fills data in your emails, reducing mistakes and saving you time and tedium. Addressing: Bookerville can automatically address emails to the guest, yourself, and/or other parties. Header Banners: put your own custom header banner image at the top of your emails - professional and brand-building. Flexible: You can override each Email Template when sending - add quick personal notes, or answer guest questions. Photos: Automatically include photos of your property to add interest and remind them what this email is about. Bookerville also stores a copy of each email you send, and displays the history of these in each booking, where you can review each email to see what was sent, when, and to whom. Watch this 6-minute video to learn more:: Email Templates Video. Combined with our much-acclaimed Automatic Scheduled Emails, Bookerville's Email Templates provide a rich and convenient tool for streamlining your correspondence.